It’s not often a band comes up with a flawless debut, but, ladies and gentlemen, please say hello to Iris Divine: a three-piece from Northern Virginia, Iris Divine certainly go for the throat with their exhilarating first outing ‘Karma Sown’. It’s an album which is as exciting as they come, and displays the depth of maturity often associated with a band’s fourth or fifth release. Obviously, guitarist/vocalist Navid Rashid, bassist Brian Dodds and drummer/keyboard player Kris Combs are on a mission to unveil their music to as wide an audience as possible as quickly as they can, so have cut to the chase and created, well, a masterpiece of the genre. It’ll be one hell of a surprise if ‘Karma Sown’ doesn’t end up sitting in many critics’ 2015 Album Of The Year Top Tens when the scores are tallied up in December. At its more commercial end, ‘Karma Sown’ evokes the spirit of Rush – say, for example, in the mid-section of ‘A Suicide Aware’ – but for the most part the album slips into the driving progressive furrow cut deep and lovingly by Evergrey: in fact, given the band’s knack of dropping melodies and hooks aplenty into their material, Tom Englund’s outfit is probably the most obvious point of reference, with the heavier end of Threshold and the inherent subtleties of Pagan’s Mind added to the mix. 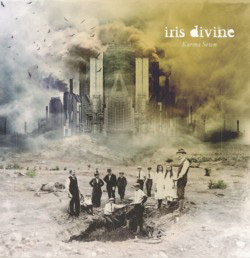 But that’s not to say that Iris Divine are imitators, as the band have a number of tricks up their sleeve to keep their compositions fresh and distinctive. Nothing clocks in at less than five minutes, giving the songs space to breathe and develop, but conversely, none of them is too long to outstay its welcome. Not only is this a glorious debut, but it also indicates that collaboratively Rashid, Dobbs, and Combs have a pretty healthy future ahead of them. Trust me on this.